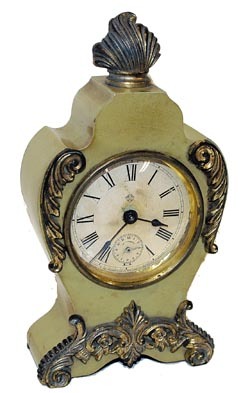 Ansonia Clock Co. enameled iron cased mantle clock, "Advance", C. 1894. This is an alarm clock designed with metal ornaments and came in various colors, this one green. Metal case is 9" high, still retains good paint and adequate gilt on the ornaments. Signed paper dial, original knobs on the back, one day time and alarm movement is running. Ly-Ansonia #1078.